Attention Marketers: Is Direct Mail Dead? 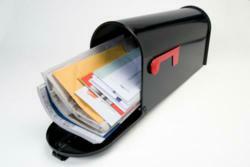 As more businesses turn to e-mail, marketing expert, Charles Gaudet, says the opportunity for direct mail is growing. Entrepreneurs and small business owners are taking advantage of the speed of online communication using email and social media. At the same time, while these businesses are saving thousands of dollars over traditional "paper and ink" mail, marketing expert and founder of PredictableProfits.com, Charles Gaudet, says there is a tremendous opportunity in direct mail that’s being ignored. On January 30, 2012, Joyce Carrier, manager of Advertising and Promotion for the USPS said 64% of consumers reported that they value the mail they receive in their mailbox. This confirms an earlier 2008 DMN News/Pitney Bowes survey showing that over 52% of people receive greater satisfaction from reviewing their mail received through the USPS as compared to e-mail and over 94% of consumers took action on a promotion offer or coupon that they received through direct mail. 1. Don’t Mass Mail. Clearly identify your target market and write specifically to their needs. The better, more targeted your list, the greater your response. 2. Use a Stamp. Sending your mail via bulk mail instantly gives the impression of bulk mail (also known as ‘junk mail’). 3. Hand write the Envelope. Many printers have a program for mail merging your envelopes with a special handwriting font. This will increase your open rate. 4. Write Good Copy. Be sure to capture their attention with a good headline; talk about the problem your prospect is having; inspire further interest by introducing the solution; create desire for the product; and prove the reader with a strong call to action. 5. Personalize. Use the person’s first name and make the mail as personal as possible. People want to know you care about them and that they’re not just another number.